Hello, hello! It's been a while since I've hung out around here! I'm truly sorry - it's just that the kitchen in the house I was living in is absolute garbage. Big enough for one person MAX, constantly covered in tomato sauce spatters (*eye roll emoji*), and with no room to comfortably cook, bake and photograph without wanting to end it all. Plus, one of my roommates was between jobs, and made it a habit to sprawl, clad only in boxers, across our couch all day urrday watching sports or rom coms and nothing in between. As much as I love hanging out with him, my cooking process involves lots of singing and scurrying, and it just didn’t work well with the general environment. You understand, right? Good! However! I just moved back into the suburbs with my parents to save money and avoid entering a new lease in anticipation of my upcoming move to LA. While living outside the city isn’t my ideal situation, it’s worth it for the future opportunities, improved quality of life and – most importantly – spacious kitchen! So I’m back, y’all, and I’ve got recipes for dayyyyys. Let’s get started with these cookies! As you will probably know if you’re as Bachelor-obsessed as me, last night was the finale of this season of The Bachelorette. Minnesota’s sweetheart, Becca Kufrin, was able to take her pick of husbands between Garrett Yrigoyen, a man whose Instagram tastes include alt-right memes that call feminists “fat” and Parkland students “crisis actors,” and Blake Horstmann, a good ol’ Colorado boy with crippling codependency issues. Wow, what catches! Clearly, the only way to get through this 3 hour (?!) shitshow was with friends, wine, Indian food, and these cookies. If you’ve ever had Trader Joe’s Cowboy Bark, you know it’s the closest legal substitute for crack. Semisweet chocolate studded with Joe-Joe pieces, pretzels, peanuts and more, it’s a salty-sweet chunk of heaven. 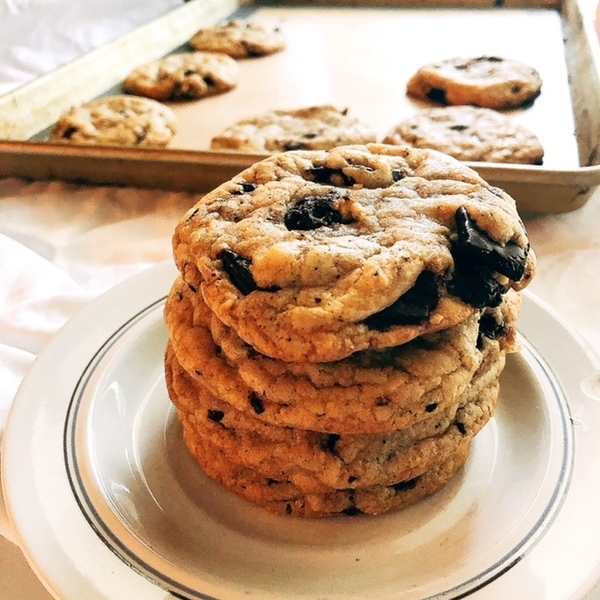 So, when I was dreaming up these cookies, it made perfect sense to chop them up and toss them into the dough in place of standard chocolate chips! After all, the Bachelorette finale comes only once a year! Let me tell you – these cookies went FAST. Three were gone before I even left my house for the party, and the rest disappeared shortly after I arrived (barely lasting past the delivery of our palak paneer). If you want to be the star of your next soiree, make these ASAP. First, preheat your oven to 350F and line a baking sheet with parchment paper. 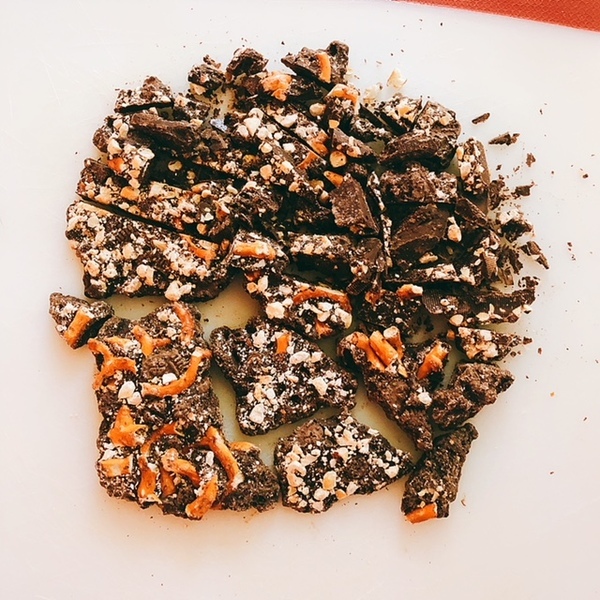 Chop up your chocolate bar into small chunks - the more chunks, the better distributed the mix-ins will be in your cookies! Next, brown your butter. Heat your stick of butter in a saucepan over medium heat, and stir consistently as it starts to bubble. After a few minutes, when those bubbles have subsided and amber bits have collected in the bottom of your saucepan, remove the browned butter from the heat and transfer it to a large mixing bowl to cool. While the butter is cooling, whisk together your flour, baking soda, and salt in a medium-sized bowl. Into the butter add both sugars and mix well to combine. Whisk in your egg and vanilla extract, then add the flour mixture and stir just until combined. Fold in your chocolate, then scoop the dough out in 2T-sized balls onto the baking sheet. Bake for 10-11 minutes, just until the cookies are beginning to brown around the edges, then remove them from the oven. 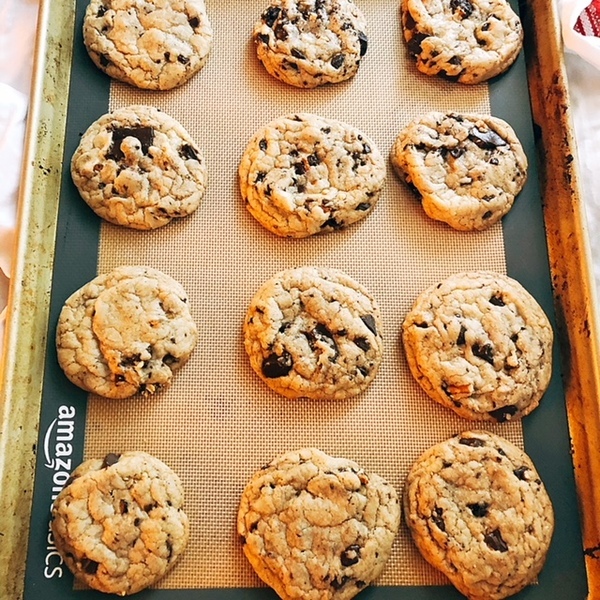 Let the cookies cool on the baking sheet for 2 minutes, then remove to a cooling rack to cool completely. Then, dig in!